More than just exceptionally robust, our argyle-decorated men's Storm Bloc with BlueGuard Long Cotton Country Socks are GUARANTEED to not develop holes - 30 times more durable than any comparable standard branded walking sock. 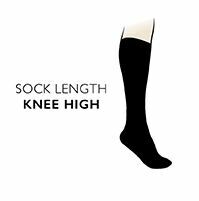 These knee length socks are ideally designed for any and all country uses, from wearing in riding boots to tucking a pair of plus fours into them. Storm Bloc With BlueGuard Long Cotton Country Socks are made from a cotton rich blend that incorporates BlueGuard yarn, and designed with woven arch supports, positioned terry cushioning, an extended heel, durable calf panels and a reinforced toe seam.